I woke early one morning. The sounds of silence filled the room and darkness seemed heavy all around me. As is typical, my thoughts were immediately drawn to the failing conditions of our nation. With my wife lying next to me and my two sons not far away, concern for their future drew me into a deep moment of prayer. I sought God's wisdom. This is what He laid on my heart. Many years ago, a similar scenario was playing out in a different part of the world. God's people were oppressed by an arrogant king named Nebuchadnezzar. God heard the prayers of His people and He intervened in a very dramatic way. Notice this true account of an awesome God Who brought about radical repentance in the life of the most powerful man on earth. Immediately the word was fulfilled against Nebuchadnezzar. He was driven from among men and ate grass like an ox, and his body was wet with the dew of heaven till his hair grew as long as eagles’ feathers, and his nails were like birds' claws. At the end of the days I, Nebuchadnezzar, lifted my eyes to heaven, and my reason returned to me, and I blessed the Most High, and praised and honored him who lives forever." Q: What would happen if America's Christians began praying for our own modern-day fulfillment of Daniel 4? A: Our Nebuchadnezzar could also be brought to his knees and led to proclaim, "Now I, Barak Hussein Obama, praise and exalt and glorify the King of heaven, because everything he does is right and all his ways are just. And those who walk in pride He is able to humble." 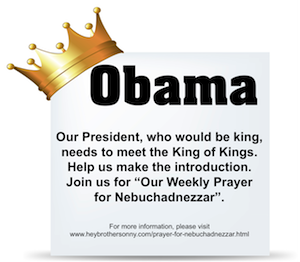 Challenge: Please join this ministry in "Our Weekly Prayer for Nebuchadnezzar". Every Tuesday, we post reminders in the various venues of social media. When you see them, be sure to reflect on the urgency of our mission and pray for God's dramatic intervention. Remember, we are not praying against the President, we are praying FOR his repentance. Please pray with pure motives. Attention International Readers: Repentance from America's leaders can only serve to improve your part of the world as well. We welcome your participation in "Our Weekly Prayer for Nebuchadnezzar". I acknowledge that You are the all-powerful God Who stands behind the thrones of men. I also know that, when Your people ask, You often humble those who rule over them. Our country desperately needs leaders who submit to Your supremacy. It's for this reason that I am now praying Your will be done in the life of America's Nebuchadnezzar. Does God still intervene in the affairs of men? America needs Christians who are willing to demonstrate radical faith that He does. Show the world you believe. Make it real! Back to Top of "Our Weekly Prayer for Nebuchadnezzar"